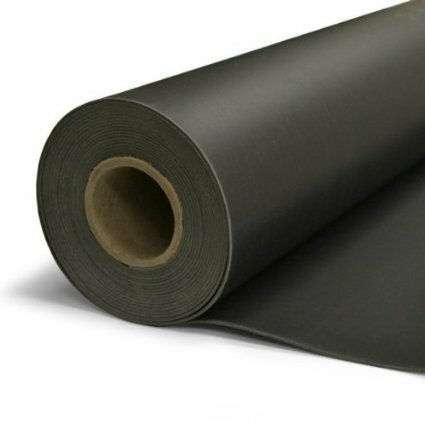 Mass Loaded Vinyl (MLV) is the preferred solution for sound proofing interiors easily and effectively. It packs a large amount of mass in a minimal amount of thickness. Ideal for those who desire a quieter home or work environment without compromising the space or dimensions of a room. MLV can be used in many places such as in walls and ceilings, under carpet to soundproof the ceiling of the room below, or wrapped around noisy pipes. Will not rot or shrink, and is resistant to many environmental factors such as weak acids, oils, and alkalies. It is non-toxic and virtually odorless. STC rating 27, Weight 1 lb./sq. ft.
Made in USA from virgin material (no recycled content), odorless. Use for soundproofing basements, conference rooms, studios, apartments, etc. If you have any questions about this product by Burning River Buys, contact us by completing and submitting the form below. If you are looking for a specif part number, please include it with your message.